CLEMSON, SC – The Clemson volleyball team downed Syracuse, 3-1, (25-16, 25-23, 21-25, 25-23) on Friday night in Jervey Gym. The Tigers (14-14, 8-9 ACC) pounded out 61 kills in evening the season and all-time series with the Orange (14-15, 9-8 ACC). Clemson was propelled by seniors Mo Simmons and Hannah Brenner, who will be honored on Saturday at 6 p.m. prior to Clemson’s match with Boston College. Brenner had .455 percent of her sets converted for kills to the tune of 51 assists, while also tallying five kills. Brenner’s decision-making was good most of the night, as the school’s 4th all-time leading assister found Simmons for 19 kills, and Leah Perri and Karis Watson for a dozen apiece. Watson gave the Tigers a good boost early, tallying five kills in the opening frame, which Clemson took control of with ten straight points early. Watson hit .450 on the night, with just three errors in 20 swings. 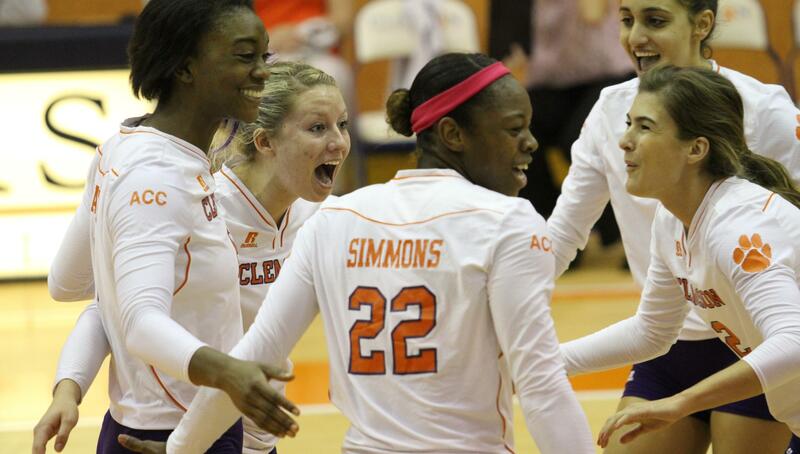 Simmons got off to a slow start with just five total kills through two sets, both Clemson victories. However, she turned it on late, tallying seven kills apiece in each of the final two sets. Irem Bayramoglu tied a career-high with 17 digs, and also added a personal-best five assists. Niki Collier had 15 digs from her libero spot, and Kristin Faust was a kill shy of a double-double with 14 digs and nine kills. Simmons had 12 digs to go with her 19 kills, her fourth straight double-double and 18th of the season. She hit . 245 in the match on 49 swings, and moved into fourth on the single-season list for most attacks with 1441. Clemson earned a season split with Syracuse with the win, and also evened the all-time series at 2-2.